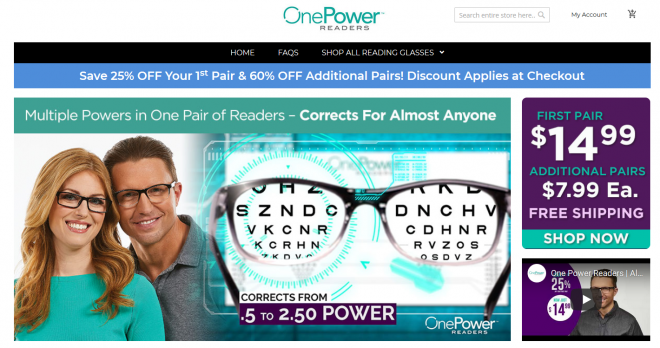 One Power Readers are a pair of one size fits all reading glasses that auto correct vision. Do they really work? Here is my One Power Readers review. One Power Readers are glasses that adjust their focus according to individual needs using Flex Focus Optic science. The official product website is onepowerreaders.com, which was registered in May 2018. The screenshot below shows how the product website looked in March 2019. A pair of One Power Readers costs around $15. They can be purchased online at the product website or at Amazon, and can also be found in some stores. I bought my pair at Target for $14.99. The product website sells additional pairs for $7.99 each after the first pair is purchased for $14.99. As Seen on TV has been advertising the One Power Readers lately, and I’m reviewing them by request. After unboxing the glasses, I read the pamphlets that came with them, but there did not seem to be any actual instructions. For cleaning the glasses, one of the pamphlets recommended using a microfiber cloth with glass cleaner (which were not included). For my first test, I put the glasses on and began reading through the pamphlets that came with them. My initial reaction is that they they worked just fine. In the past, I’ve tested several pairs of reading glasses for my YouTube channel, so I decided to compare some of them to the One Power Readers. In my first comparison test, I set my video camera’s focus to +2.5, and began passing lenses from a couple of the glasses in front of the camera. Both a pair of dollar store reading glasses (+2.5) and the One Power Readers looked about the same, with the text in sharp focus. Then I adjusted the focus of my camera to +1.0. A pair of dollar store glasses (+1.0) passed this test, but the One Power Readers were kind of blurry, which led me to wonder if they read to automatically focus. Perhaps this autofocus was in the human eye and not in the glasses, so I continued onward. My second test was a much broader comparison with more pairs of glasses. To be as accurate as possible, I tried these glasses on while holding a pamphlet about 14 inches from my face. The glasses I tested included the One Power Readers, Hazuki, Dial Vision, +1.0 dollar store reading glasses, +2.0 dollar store reading glasses, +2.5 dollar store reading glasses, Big Vision, and Thin Optics. Results varied, yet the One Power Readers were mostly in focus in the 7-8 inch range. My vision became blurry if the distance was farther or closer than that. Recently, there was a news team that took the One Power Readers to an optometrist to have them machine-tested, and the entire lens showed up as a +2.5. They could not get the lens to test down to .5 as advertised. According to the product website, the lens is supposed to automatically adjust to your eye with what is called “Flex Focus Optic” science. In my experience, the One Power Readers did not adjust automatically, but they did operate very similarly to a pair of +2.5 dollar store reading glasses. If you need a good pair of +2.5 pair of reading glasses, the One Power Readers will work, but I would not put too much stock in the advertising claims of automatic correction from +.5 to +2.5. This is my opinion, but others may feel differently and have different experiences. If you’re looking for a highly-rated pair of reading glasses, you may want to check out this Amazon favorite. For an ugly, yet effective, pair of glasses that can be automatically adjusted, you may want to look into Dial Vision. Have you used One Power Readers or something like it? Leave a comment below and a star rating above to let us know your thoughts.